Passengers gathered in the sun lounge. 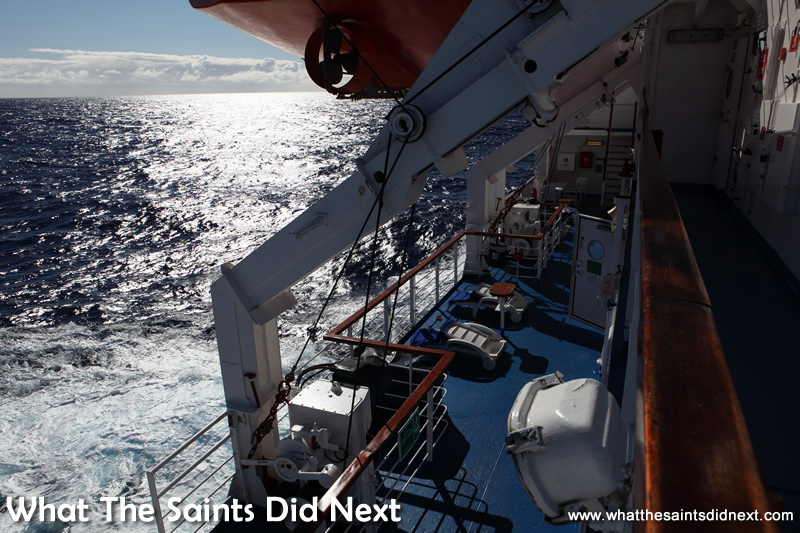 So here we are at sea, two days into our five day voyage on the Royal Mail Ship (RMS) St Helena, travelling from St Helena Island to Cape Town, South Africa. The ship’s gentle movement combined with the hum and vibration from the engine far below, seems to induce a drug-like tiredness in many of the 110 passengers, including me. Afternoon siestas are a regular fixture. I wonder how deep it is out there? The second mate’s midday announcement on the PA system is a welcome interruption to our lunch table conversation. 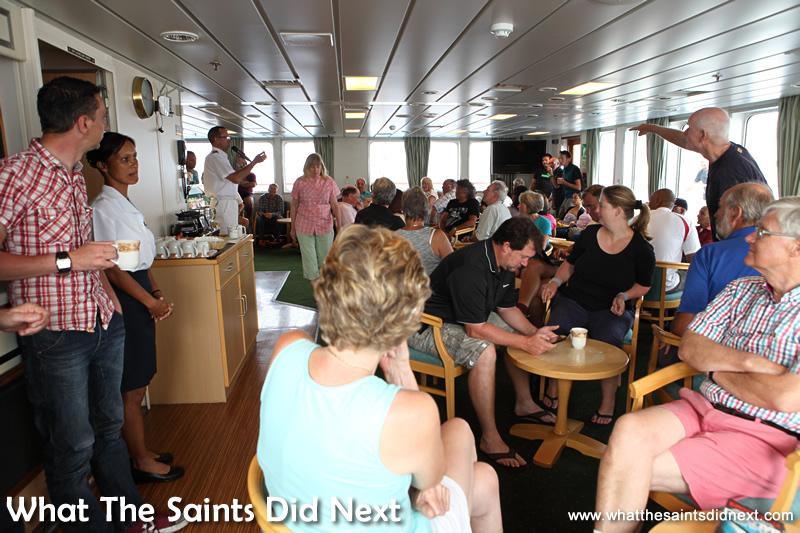 Everyone listens intently while munching on another delicious meal from the ship’s galley. “The depth of water beneath the vessel,” and the “sea temperature” causes everyone’s chewing to slow so we can listen better. In hindsight it’s quite comical how these snippets of trivia have taken on such great importance with us passengers. Would we be concerned if it was 500m instead of 1,000? Hmm! 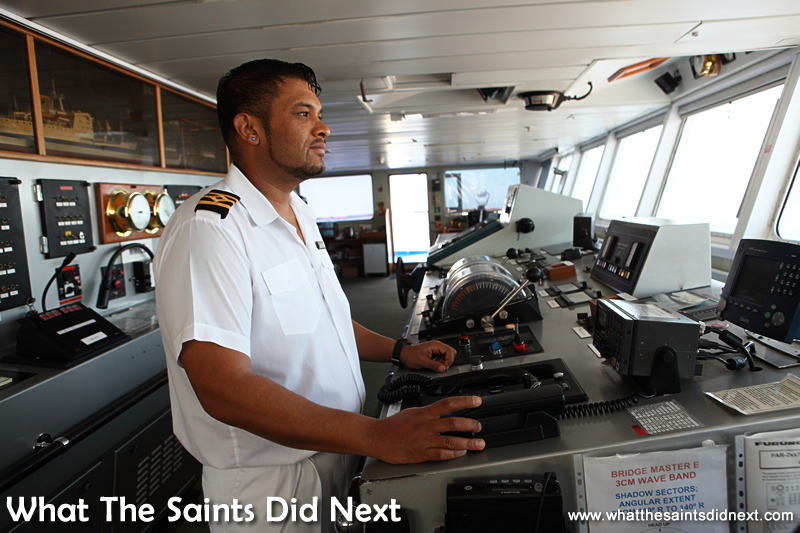 2nd Officer, Sivuyile Maliti checking the navigation on the bridge. 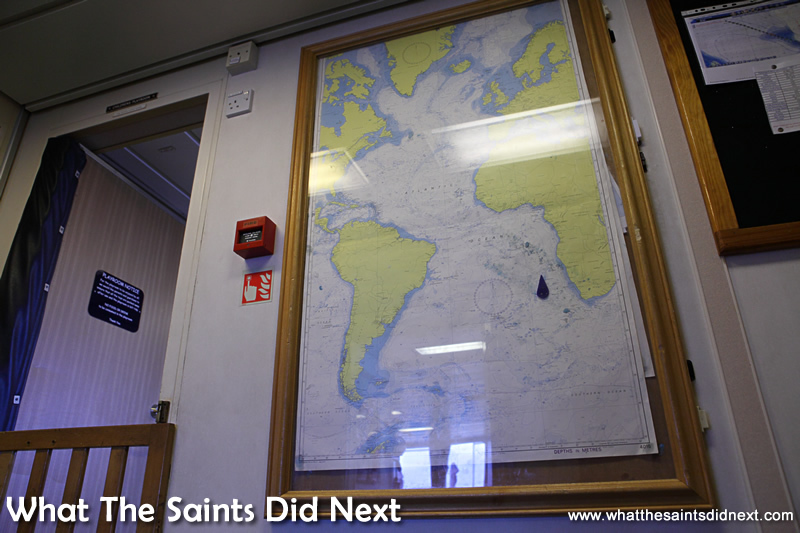 The ship’s daily navigational position is also plotted on a map outside the sun lounge. It’s all about getting the knack. Shuffleboard is extremely popular this trip and I think I know why. 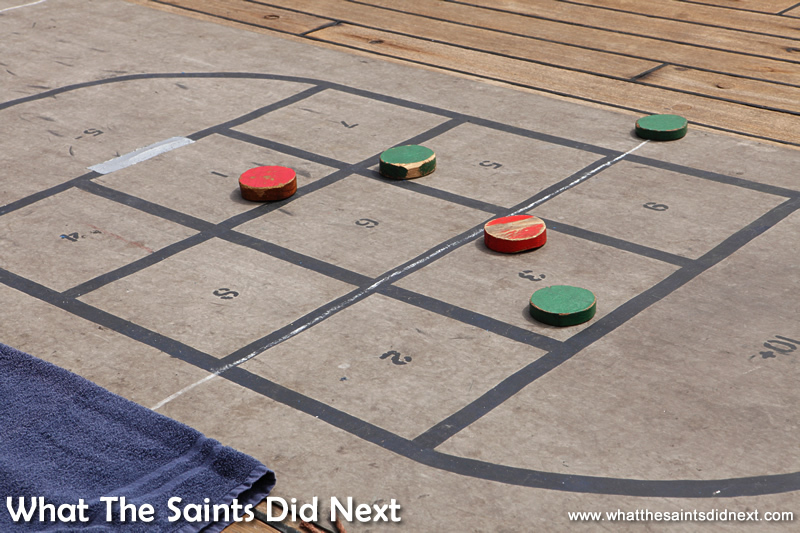 It’s a wonderful game played on the sun deck but the beauty of it is that it requires zero previous experience or athletic ability in order to quickly grasp the technical aspects and become good at it. You just need to ‘get the knack.’ A competitive spirit quickly develops. As with all games, the movement of the ship alternates between assisting and hampering the individuals’ skill level. Excellent fun. Great setting for a game of shuffleboard. Welcome to this brand new day at sea. 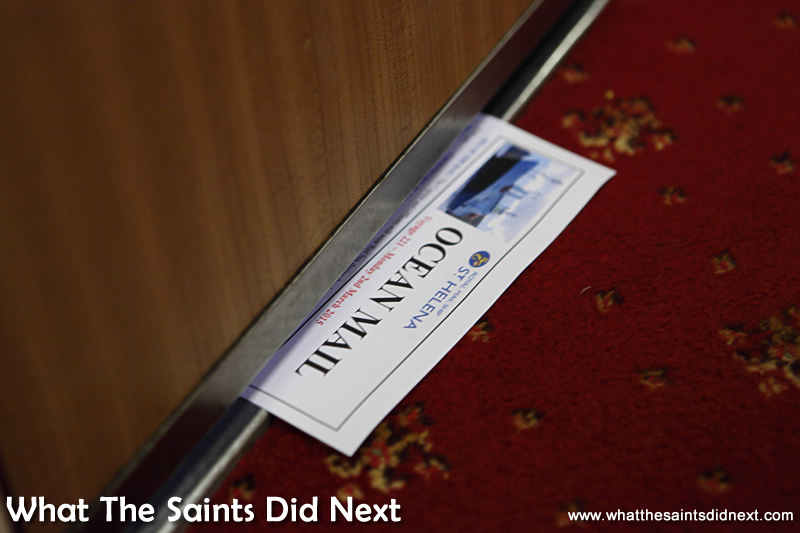 Every morning, the ‘Ocean Mail’ newsletter is slipped under our cabin door, informing us of the day’s events ahead. ‘Rig Of The Day’ could be a confusing title; this tells us what the ship’s captain and officers will be wearing that day. Like most passengers on this trip, my own rig is strictly flip flops, shorts and t-shirt. But there’s more! 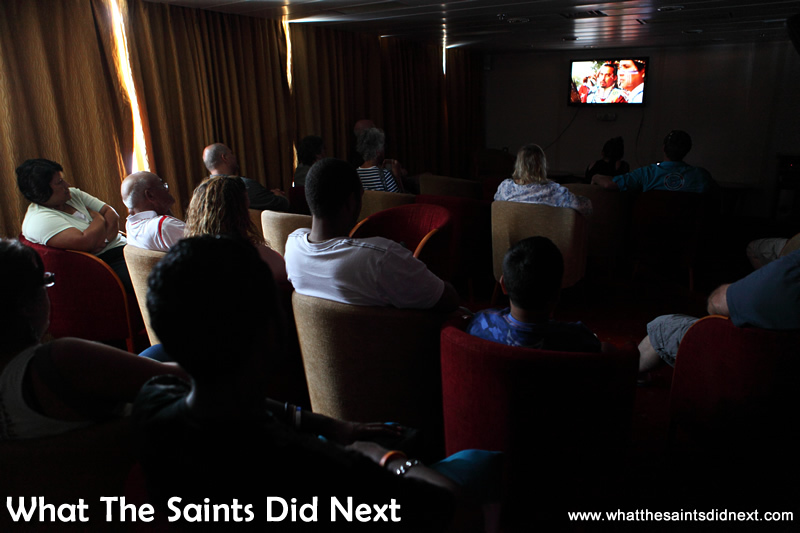 Movies or documentaries are scheduled for the large TV screens each morning at 10:30, in one of the lounges. Another is usually at 1.30 or 4pm in the afternoon. 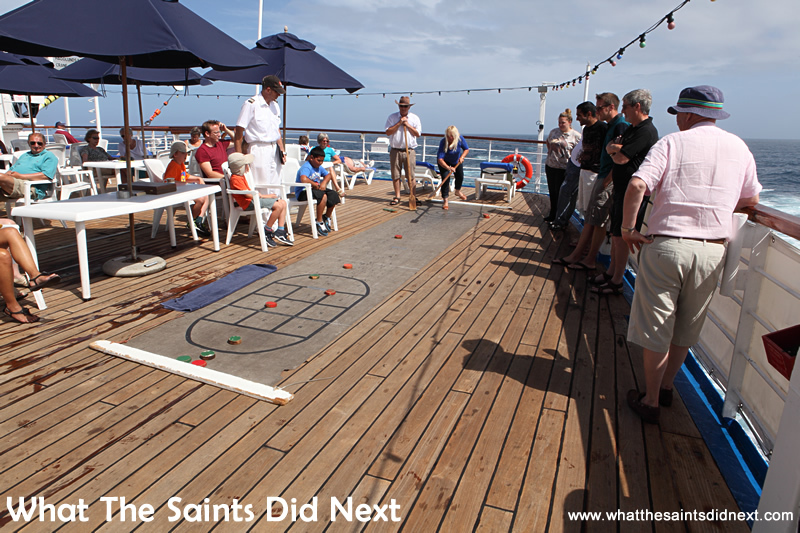 The active morning events include shuffleboard, a deck quoits tournament and the traditional game of deck cricket with passengers taking on the ship’s officers. It’s all in the Ocean Mail. The Ocean Mail is slipped under every cabin door before everyone wakes up. Movies on the large screen TVs are advertised in the Ocean Mail. Roots & Shoots in the main lounge. One of the events on this trip is being organised by Sharon and me. In 2009 we presented a photographic exhibition in St Helena called, ‘Roots & Shoots.’ It’s been packed away for more than five years, and now for the first time we’re displaying it again. It’s a collection of 26 studio portraits; a cross section of Saints of all ages, genders and occupations. Accompanying each photograph is a short story about an aspect of that person’s life, written from an interview in 2009. We’ve also appended a short status update for 2015. I’m pleasantly surprised at the number of people who come to view the exhibition, taking their time to read the stories. A few people want to talk afterwards about the exhibition and learn more about our lives and culture on St Helena and I’m happy to oblige. Chief Officer, Adam Williams, keeping the 4-8 watch on the bridge. It’s day four at sea and Chief Officer, Adam Williams, is giving me a tour of the bridge. So much has changed since I last travelled, most notably the addition of a computer workstation in the corner and what looks like many more large display screens – or is it my imagination? 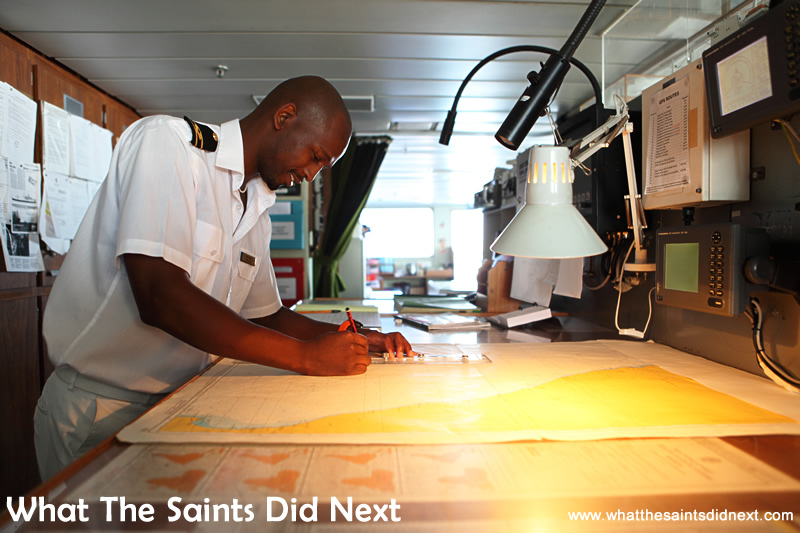 The traditional navigational paper chart has now gone digital. Gone are the days of sextant calculations, lining up the sun and horizon to plot the vessel’s position; something that used to baffle me constantly. This new system is more like a video game. I’m sure I could navigate using this new fancy pants screen, but I don’t tell Adam! As the Chief Officer, Adam is next in line to the captain. Best not suggest I could get the ship to Cape Town! I should mention, the paper chart is still in use alongside the new system. 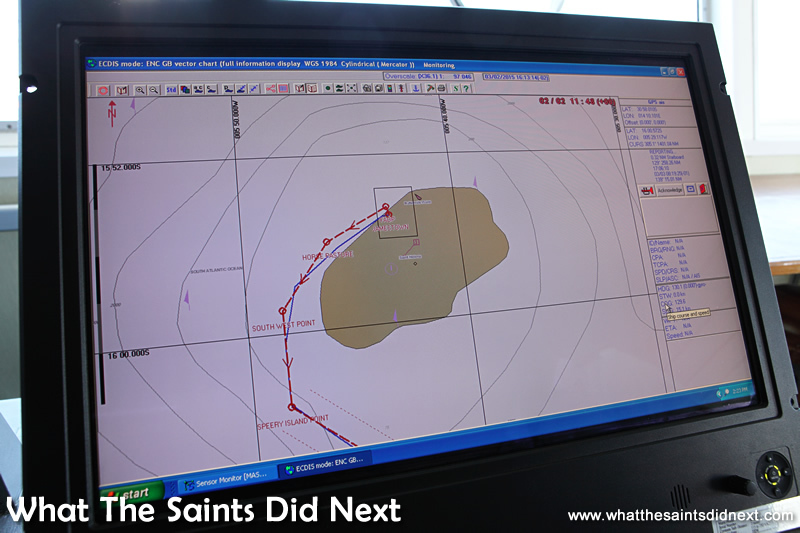 The new chart has instant memory recall – this is our St Helena departure. 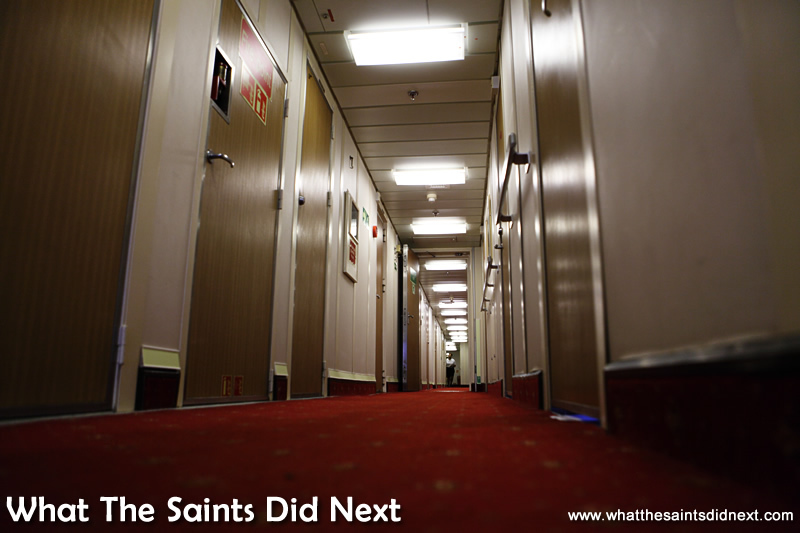 That’s part one of my top 10 highlights from this voyage. Look out for part two which will be posted shortly. 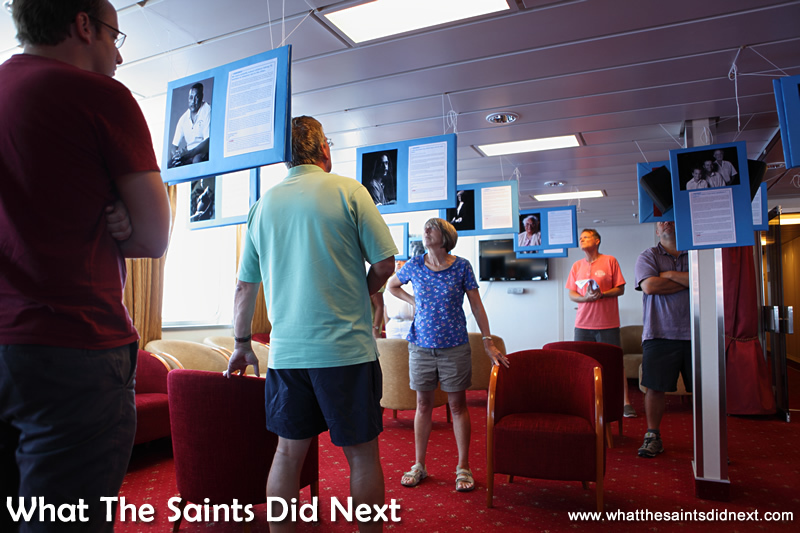 In the meantime, what’s your best memory from your voyage on the RMS St Helena? Going to church at Sea…. The song that’s played when leaving St. Helena ‘ St. Helena Island’… The moment when you are looking for the Island through the cloud bank and it pops out at you, I get emotional every time ! I really enjoy your posts, Thank you ! Thanks for rekindling fond memories of our RMS trips.Great photos too. Thanks for the feedback guys. Yeah, the ship has given so many of us lovely memories. Haha, I like your No.1 I always interested in that too. Most to hear how many miles are left to reach the destination! 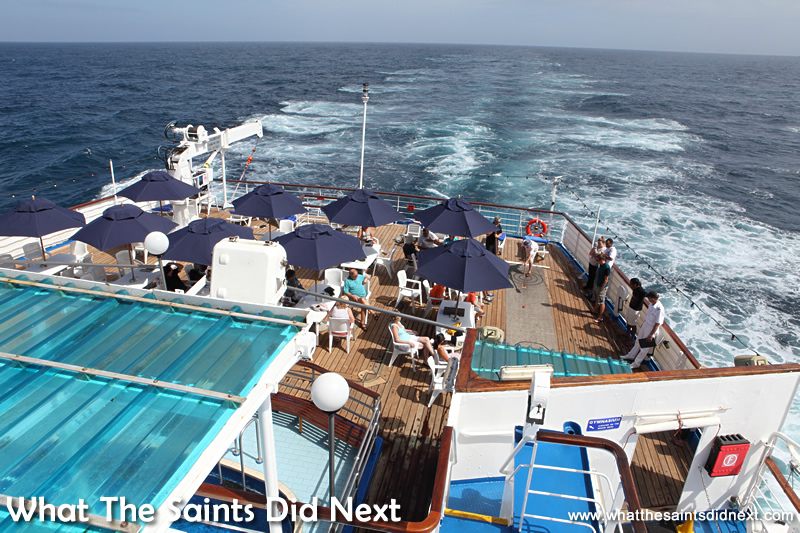 Always a nice moment when the nearest point of land becomes the destination rather than the departure port. Thanks guys, hopefully there are going to be future visits from you as well with more happy memories. Cheers. Am enjoying the blog guys. I love that fabulous tinkly glockenspiel melody played over the tannoy before lunch and dinner which always seems to propel passengers into action…..hungry or not! Have you ever tried to sing it? It’s not easy!